Gregory Geffrard/Photo: Jonathan L. Green. 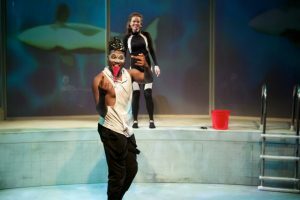 Sideshow Theatre has rendered a profound and gorgeous world premiere production with “Tilikum” that will move you and provoke you in the best way. Author Kristiana Rae Colon and director Lili-Anne Brown have assembled a majority female/non-binary artistic team to bring an aural and visual seascape to life, and tell this story through poetry, movement and pulsing drums. Matt Fletcher and Gregory Geffrard/Photo: Jonathan L. Green. “Tilikum” is a glimpse into the true story of the capture and captivity of a 12,000 pound male orca whale (Gregory Geffard), and his struggles with other captive whales (Coco Elysses, Melissa F. DuPrey and Joyce Lisa Rasa Lindsey), human trainers like Dawn (Sigrid Sutter), and the isolation his captors put him in to maintain the status quo. The park owner (Matt Fletcher) ultimately has an investment to protect, and goes to great lengths to muzzle Tilikum and downplay the injuries and deaths that have come from this increasingly hostile arrangement. Return to the wild is never on the table; as Tilikum puts it, “fins that know walls can’t know waves again.” Now, replace that whale you’re imagining with a black man in a hoodie and know that in a very profound way, “Tilikum” is not about sea life. It’s about mass incarceration, the effects of trauma and enslavement on humans, and the injustices being dealt to incarcerated men, women, and children of color as we speak. Though Tilikum is prone to outbursts, Dawn and the park owner would be greatly inconvenienced to lose their star performer, so they tell themselves little lies to keep their consciences clear. Lies like: these creatures are safer in captivity, they’re stage hams who perform for us because they really want to, they are our friends and would miss us. Again, this is not about whales. Gregory Geffard is a fantastic open heart and open book as Tilikum. He holds depths of sadness, anger and joy in a world that only understands his obedience and punishes disobedience. He is in crisis to see his pod and the woman of his dreams again, but he knows he is forgotten. Music director Coco Elysses joins musicians Melissa F. DuPrey and Joyce Lisa Rasa Lindsey in portraying other female captive whales with the sounds of congo, barilles and doumbek drums. They are aloof, sinister and powerful, that is, until Tilikum begins to understand their sounds. Gregory Geffrard and Sigrid Sutter/Photo: Jonathan L. Green. As Dawn, Sigrid Sutter has the affectation of a perfect, carefree, 1986 Virginia Slims commercial star. She knows her part in this ocean park facade but doesn’t have the bravery to break the cycle. Matt Fletcher is an unnamed park owner filled to the brim with toxic male venom; he leers at his female job applicants and is blanket-dismissive of the real problems staring him in the face. The owner can read a little over the top and one-dimensional, but there’s something so fitting about white male stereotyping for a change. 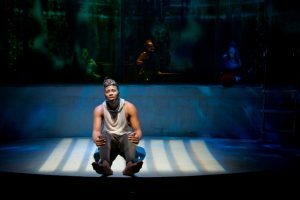 For as rich as this production is, it doesn’t shy away from evoking the mass spectacle of orca shows, and inviting the audience to make their voices heard, too. It’s brazen, funny, and spirit-lifting above all else, and I couldn’t give “Tilikum” a higher recommendation. TEN WORD SUMMARY: Wait a minute — this isn’t strictly about whales, is it?